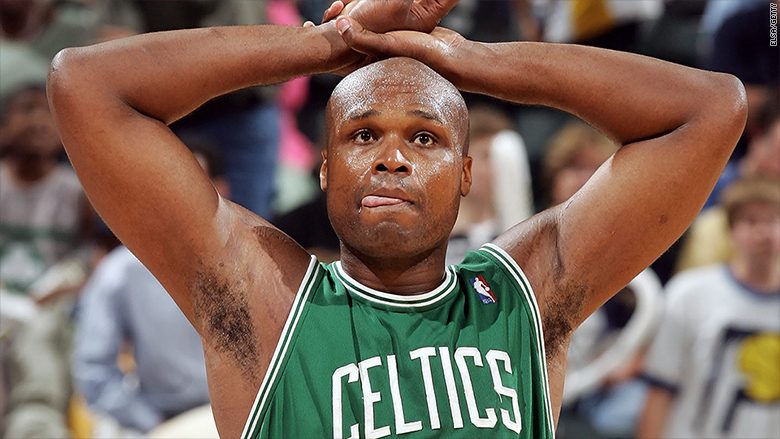 Antoine Walker believed his financial future was a slam dunk. "I thought I was set for the rest of my life," Walker told CNNMoney. "My story is sad. It's sad to see other guys work so hard throughout their life -- and then they just lose it in two or three years." That's why Walker, now 38, is now working to steer young athletes away from the mistakes he made. Walker and former NFL linebacker Bart Scott recently teamed up with Morgan Stanley Global Sports & Entertainment to bring real-life lessons to today's players. But first Walker had to figure out how he went from fat NBA paychecks to financial rock bottom. Cars, jewelry and homes: As with many other sports stars, instant wealth meant instant luxury for Walker. Instead of thinking about the future, he spent lavishly on cars, jewelry and homes. "I created a very expensive lifestyle. That's how you lose your wealth real bad at the beginning," Walker said. Given his humble beginnings, Walker wanted his friends and family to enjoy his riches as well. He estimates he helped about 30 people move to "better situations." He gave cash to many of them -- often without holding them accountable. "I gave them whatever they wanted and spoiled them. You can't do that," Walker said. "It ended up being an open ATM throughout my career." He also lost large sums of money gambling, although Walker insists this wasn't the main cause of his financial collapse and that media reports are overblown. Real estate firm goes bust: The real catalyst, Walker said, was the Great Recession. The economic chaos caused the implosion of Walker Ventures, his Chicago real estate firm. "We got caught in the recession. We had a ton of undeveloped real estate. It went bad. The banks wanted their money back," he said. As if that wasn't bad enough, Walker had unwisely put up his personal financial portfolio as collateral. He ended up being forced to pay back about $20 million to banks. Walker filed for bankruptcy in 2010. A year later he pleaded guilty to felony bad check charges, according to court filings. Walker didn't serve jail time due to a plea agreement, but the former NBA star was ordered to pay off gambling debts. Real-life parables: Now that he's out of bankruptcy, Walker is working to educate future sports stars. He's working on "Gone in an Instant," a documentary about his personal boom-to-bust tale. As part of his gig with Morgan Stanley, Walker recently spoke to athletes at Boston College and the Seattle Seahawks about his mistakes. The hope is that these "real-life parables" from Walker and Scott will educate the younger athletes, Drew Hawkins, head of Morgan Stanley's global sports and entertainment division, told CNNMoney. "These individuals are forced to make decisions as teenagers and these decisions impact them for a long time," said Hawkins. Advice for today's stars: Walker has two simple pieces of advice he hopes the younger generate walks away with. 1) Get the word "no" in your vocabulary when dealing with friends and family. "Be prepared to use that word a lot," he said. 2) Think about the future, not just the here and now. "You can still enjoy your life to the fullest, but let's preserve some of that wealth for your kids -- and for their kids," Walker said.